Praise him with trumpet sound; praise him with lute and harp! Let everything that breathes praise the Lord! throughout the year. Rehearsals are on Thursday evening at 6:30 in the Wilson Classroom. Everyone who loves to sing to the Lord is welcome to join. The church also has a three octave handbell choir which meets on Thursday evenings at 7:30 in the CE Wilson Classroom. Substitute ringers are always needed. The handbell choir plays often at the Sunday worship service, and also performs for outside groups when asked. Music is a big part of our worship service, and we welcome anyone who would like to join us in this beautiful way of praising our Lord. Vocal choir provides special music during worship September through May. The choir meets Thursday at 6:30pm to rehearse in the CE Wilson Room. Soloists and groups provide special music during the summer months. The Bell choir provides a special musical offering for occasional worship services. Rehearsals are Thursday 7:30pm in the CE Wilson Room. There is always rooms for more ringers. In 1861 the church obtained a 'harmonium', which was later called "Reed" or Cabinet Organ. The first pipe organ was installed in 1884. A Moller organ was installed in 1908. Upon the completion of the installation process John A. Bell of Pittsburgh performed the inaugural organ recital in the spring of 1908. In 1951 the organ was rebuilt, using many of the original pipes. Steinway& Sons produced this 7 ft 3 in Model C Rosewood instrument in New York City in 1885. The keyboard features 85 keys, rather than the 88 keys found on standard instruments. The piano was sold to a private customer and found it's way to the Brookville Presbyterian Church in 1898. In 2010 a visitor who was well acquainted with Steinway instruments informed the staff that this particular model with the reduced number of keys was a rarity. 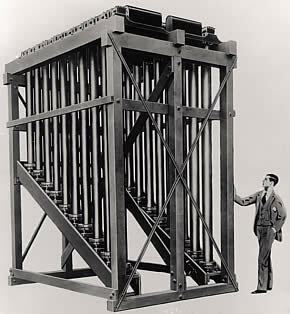 The Deagan Chimes were installed in 1928 and were dedicated on Easter Sunday. 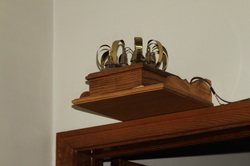 The chimes were a memorial gift given by the family of Judge Charles Corbett after his death in 1927. A keyboard was installed to the right of the organ which enabled the organist to play hymns using the chimes. Deagan Tower Chimes are considered the finest tower chimes, having thicker walls, richer tones and more accurate tuning capabilities. Deagan built some 440 instruments between 1917 and 1958. Currently the chimes located in the Brookville Presbyterian Church are one of a dwindling number of sets still in a condition to be used. The addition of an electrical player has provided the opportunity for the set to play daily. Bach is reported to have written music calling for Zimbelstern and to have used the Zimbelstern during his many years as a church organist. The instrument provides a brilliant voice to devotional works. The word Zimbelstern means "cymbal-star" and the first instruments were indeed made in the shape of a star. The organist controls the Zimbelstern by way of a small keyboard mounted on a bracket behind the organ bench.